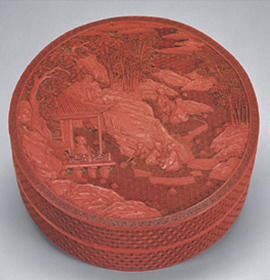 A lacquer box of circular form, the straight sides carved with hexagonal diaper pattern and terminating in lipped rims. The flat top is carved through a thick layer of red lacquer and depicts two figures standing on a balustraded terrace in a landscape setting. The larger figure is dressed in a long robe and strokes his beard while looking at the full moon that appears in the sky. His young attendant stands before him and holds a broom in both hands. The platform protrudes from mountain cliffs, situated above floating clouds and surrounded by gnarled trees. The background is formed by hills and carved with square, diamond and key-fret diaper patterns, respectively indicating earth, water and sky. The interior and base are lacquered in black. 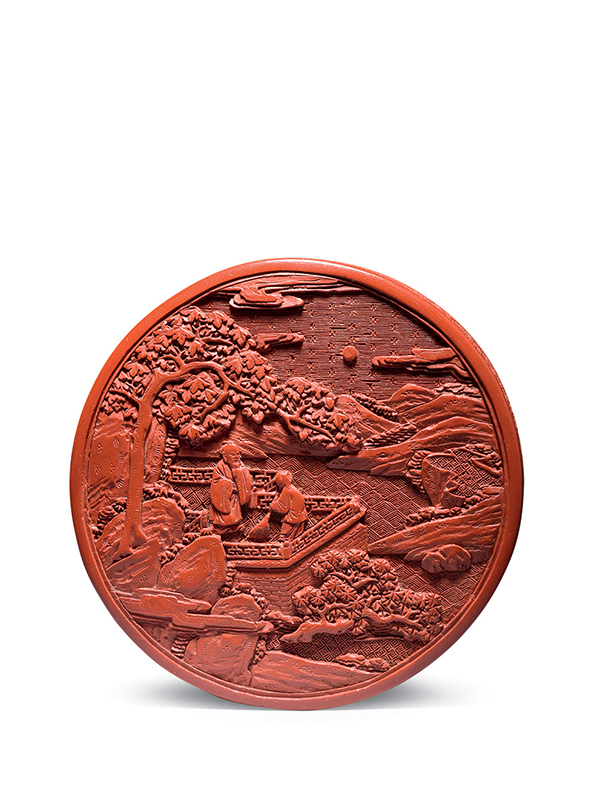 Minutely executed decorative landscape scenes are a typical feature of 18th century lacquer craftsmanship. The Chinese associate the roundness of the moon (yueliang) with the cohesion of the family, and family members gather at harvest time on the fifteenth day of the eighth lunar month, also known as the Moon or Mid-Autumn Festival. The full moon and the building above the clouds indicate that the larger figure might be an immortal living far away from the mundane world. 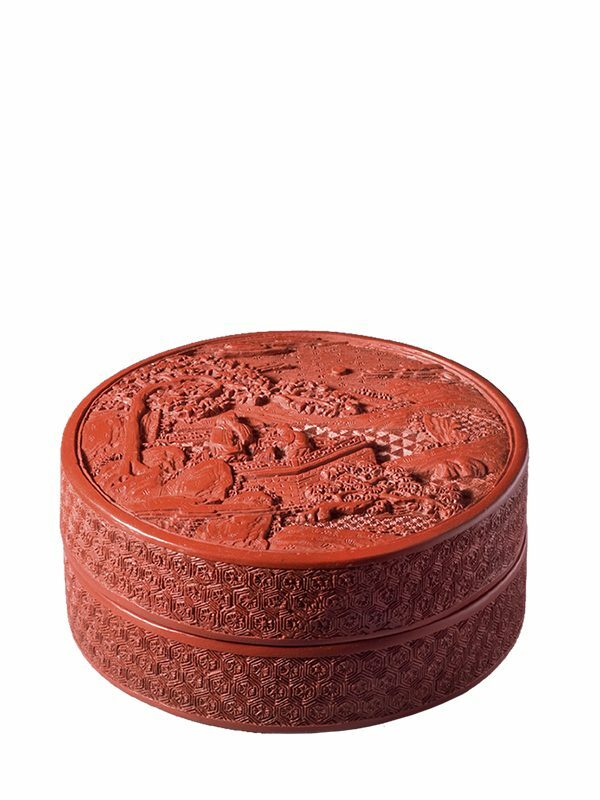 Two larger circular boxes, comparable in design and both marked and dated to the Qianlong period (1736 – 1795), are in the collection of the National Palace Museum, Taipei. One depicts a scene of floating wine-cups (fig. 1); the other a scene of releasing cranes. Both these scenes depict popular activities among Chinese literati, as does the appreciation of the moon.